I wanted to share a unique experience I had in early August in which I managed to land a blue marlin on a small kayak after hooking it trolling on a panga. I believe it was the 4th of August. I went to Rancho Leonero to do some kayak fishing. The bigger fish were out farther than was within my paddling range. 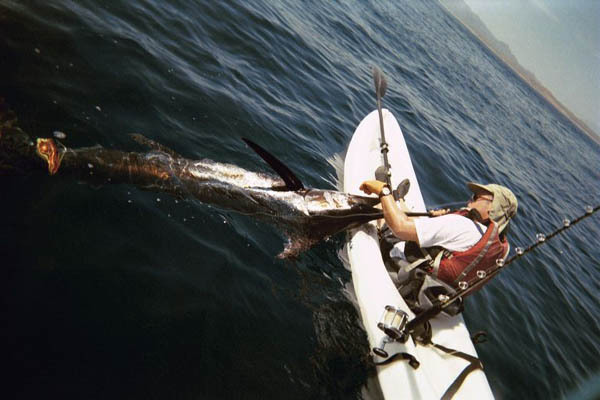 In an effort to reach the larger fish, I stuffed my yak in a panga, and had Rene, my panga driver, drop me off near the light house, but I was kind of bored and not getting anything other than needlefish. The day before, using squid trolling from my yak, I had the good fortune of landing a nice 15lb Dorado and some 10 # pargos in shallow water. However, this day offered no wind, hence no respite from the Baja summer heat, so I suggested to Rene, the panga driver, that we change the routine, and troll from the panga. The plan was that if a line got hit, we would launch the yak, I would hand the rod to him, get in the yak (I had my life vest on), and he would hand me the rod and off I'd go to land the dorado, which was what I was hoping for. I rather would have done just straight kayaking but as I said the needlefish were annoying the heck out of me. So we put out three lines, two of the rods were mine, one was his. I had seen it the day before, stuffed above in the canopy of his bimini top. It looked like an impossibly worn and old rod, and I figured that he brought it out only when they saw something they weren't planning on catching. It had a beat up old 6/0 senator reel and a rod with some rusty rollers. Anyway, we were rapping (my wife is Mexican and I know a fair amount of Spanish and love to speak it) and having fun, and I was remarking to him that I thought the water had finally turned the right color blue, and couldn't for the life of me figure out why the big fish hadn't really come in any numbers. I had been there on a similar trip two weeks prior to that and the water was green and colder than usual for that time of year, so i had expected that on this return trip, I might be able to fish the deep blue, warmer water. He said maybe it would get better soon, but probably not in time for the Bisbee (the next day it started). As we were lost in conversation near the shark buoys about 3 miles out from Rancho Leonero, I got a jig strike. Guess which line got hit? His beat up one of course. I had on it a bleeding mac 11" lure When the fish hit, I took the rod in hand, my panguero took my scrambler rental and threw it in the water, and I hopped in it. We had no idea what it was. It seemed to not move at first. For maybe a minute, while I was holding the rod waiting for him to put the yak in the water, it didn't budge, so I figured maybe with my luck it was garbage, since surely by now a dorado would have jumped in protest. Only when I got in my yak, and the pressure on the fish changed, and I started getting tugged rapidly, did it reveal itself- some type of large billfish, greyhounding with those sounds that a diver makes when they enter the water again, about 50 yards in front of me, and pulling real hard on the 6/0 beat up rental senator with the old roller guide boat rod. I was not planning for this but I was pumped and hollered out to Rene, who began to follow behind and alongside me alternating, taking pictures and laughing and talking on the radio with his buddies letting them know that I was on a billfish in a kayak. The fish towed me all over, at a serious clip, and I put my feet over to increase the drag of the boat and tried to keep myself going in the direction of the fish. I had my paddle with me, and I made sure that it was parallel with the boat so that it didn't hit the water, at that speed I would have flipped right away. It was all about balance- keep as much of my weight opposite the side of the fish, so I could keep pressure on him without getting pulled over. I kept asking the panguero what it was, he said some type of marlin, and then he realized it was a blue marlin. I kept fiddling with the drag. I know almost nothing about bill fishing. The only things I know, I learned from an ancient book that my mom has, a book that has those old pages that are all uneven and seemingly hand chopped on the end, with those old colored "plates" for pictures surrounded by rice paper. It is a 1935 edition and she has in it Vermont, I believe it's called Big Game Fishing in North America or something like that. In the book, it says that the marlin has air sacs in it's back that fill up with air as they jump out of the water, and thus if they jump out a lot in a fight, they cannot after that go deep since those sacs are full. But that is an old book and I don't know now if that is true. Anywho, I figured since he was jumping out of the water, but away from me, not tail walking, but leaps in the opposite direction, that I stood a better chance of gaining on him. I kept fiddling with the drag, which fortunately was still able to be moved. Usually on those old rental rigs it's salted still to a certain locked position. I wanted to keep him close, but not too close. I got him really close at one point, about 15 feet from me, and he stood still for a moment or two in about 6 feet of clear deep blue water. With my polarized lenses, I could see him perfectly, just like in a movie. I could see that he was tail wrapped, and he was very large, and so to be cautious I let him go out more. I had also read in that book and probably heard from other people in passing that tail wrapped billfish often expire on the line, and often do so after going deep in a last gasp effort to get away, so I figured give him more line to keep him at a safe distance, but not so much he just goes deep and dies at an irretrievably low depth. He then dragged again, pulling line off that 6/0 no problem in bursts, and leaving me with a wake. After a while, he stopped going forward, and instead he went deep, deep, deep, and I figured I better try to keep him up or he will die down there since he was tail wrapped, although I don't really know how that stuff works. 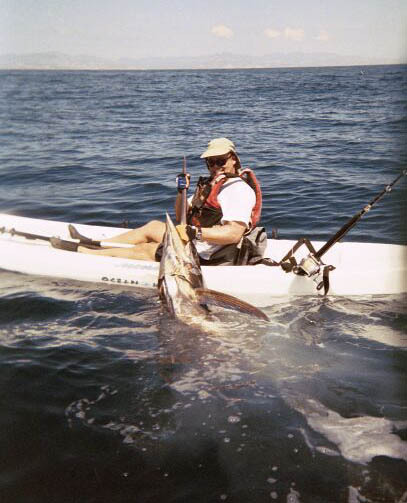 When we started trolling, Rene had joked with me about if I would go into the yak if we hooked into a Marlin and I laughed, thinking that wasn't very probable. Sure enough after about 45 minutes or more, he is about 150 feet deep, maybe way more, and he stops pulling. Now what do I do, Rene? He shouts to me, he's probably dead, "Se muerte," porque el no esta moviendo (he's dead, because he's not moving). So now what, Rene? "Pull him up." How do I do that? "Pull! Con mucho fuerca(or something like that)(with a lot of force!) So I say you have to be kidding. But he wasn't. he offered to let me in and let me do it from the panga but I declined, I figured that would defeat the whole purpose, so I pulled as hard as I could, and about 4 inches winds on the reel. 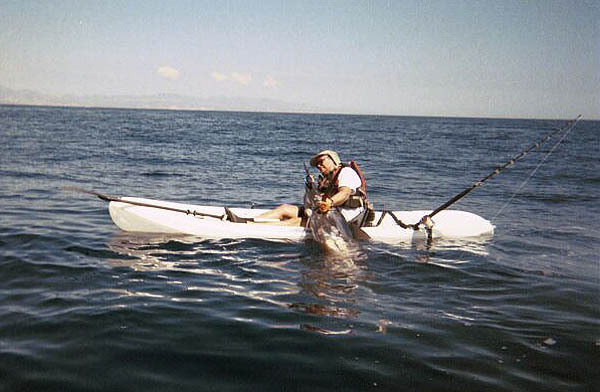 I would rather sit in that kayak for a week and pull on that fish than get help from him, cus as soon as I do that, I knew that I would have no interesting story to tell. So I started to pull like a mom pulls on a car that is stuck on her baby, that kind of crazy strain that you get pumped up to do, and was rewarded with no more than a 6" gain on the reel, like a half a crank! So I tightened the drag, and it went like that, sometimes 6 ", sometimes none, for about 30 minutes(?). After a while, my hands start to sting real bad, as well as my forearms. I had noticed that the line was coated in red snot-like clumps of jellyfish, but hadn't worried. Now it was really stinging! The only cool thing about the jellyfish was that it turned the line that was coming in red like spaghetti with a really watered down/light marinara sauce, so I had an idea as to how much line I was getting back on the reel by the amount of red stained line was accumulating. After what seemed like a long time, when I would get a half a crank, wait ten seconds, then get two cranks, then nothing, then three cranks, then a half a crank, etc, I finally I got it to my kayak!!!! I couldn't believe it. It was huge! I took him by the "Pico" or bill, and tried to pull him onto my lap, but that wasn't going to happen, so I did my best, and got some wild shots, his head is in my lap and you can see his body in the water with the line and lure wrapped around his poor tail. Look at the look on my face. I desperately wanted a shot with his body across my lap, but it was impossible. Then I asked the panguero for the camera, took some pics, and on his advice and against my better instincts, put my hand down his mouth, which was scary even though he was dead since the mouth I could have fit in, well, way more than my whole head, and I unhooked the lure, undid the drag, handed him the stick, and we boated the poor beast. Of course we couldn't believe that it had happened. Those guys pretty much have seen it all, but Rene was genuinely excited. Rene estimated it at about 180-200 lbs, as did the guys at the launch site. We then went in to the launch, took some pics and filleted the fish. I shared most of it with Rene and my pals who work there, kept some, brought some up to the kitchen, and fell dead asleep in the hammock!!!!! Anywho it was very exciting. I am still on a major high from it. I got back in the office at Rancho to talk with a buddy of mine and John Ireland walks in and sees the pics on the digital camera and got majorly excited. Then he tells Roy, the communications /acct. there, and Roy interviews me and tells me he's going to get the news out. I put some info on the Coastal kayak Fishing website giving a basic description of the event, and when I got back, I had a message from a fellow from the San Diego union Tribune, I was featured on 976-Tuna, I got "catch of the week" in the LA Times, the guy did a big article on it in the union tribune, the North County Times did an article on it, and then Gene Kirra put it on the cover of W.O.N. 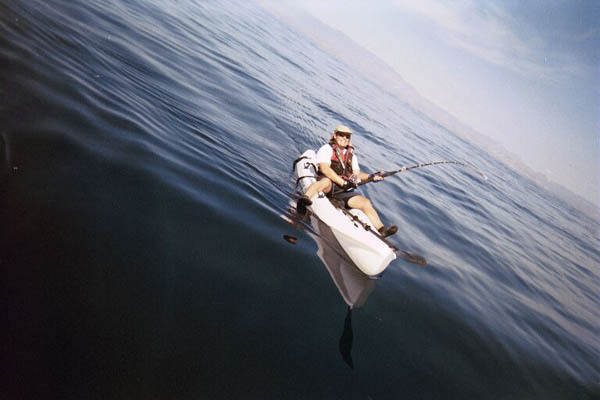 All articles that featured a picture showed the one where we put the marlin in the rental yak, which was a beat up 11' Scrambler XT that I had recently clogged the leaks with Marine Goop. But Rene the panguero had taken a whole roll of shots with my disposable camera from his panga. I held onto that and then when I couldn't wait any longer, took a cab into San Jose Del Cabo to the Kodak store and got them developed. I was REALLY nervous that they wouldn't come out right, and I knew that it was important that they do, because I felt like the pic of the marlin stuffed into the yak on the beach looked too packaged, and didn't really prove anything. When I got them back I was SOOO stoked! The rod had some old salty 50 # test on it. I would have preferred releasing the fish but it was, as is clear in the pictures, tail wrapped.